This recipe is inspired by a dish from the Somali kitchen. Last summer I ate Somalian bhajia for the first time and it was love at first bite! They where served together with a fresh, green and very hot sauce that I can’t remember the name of. 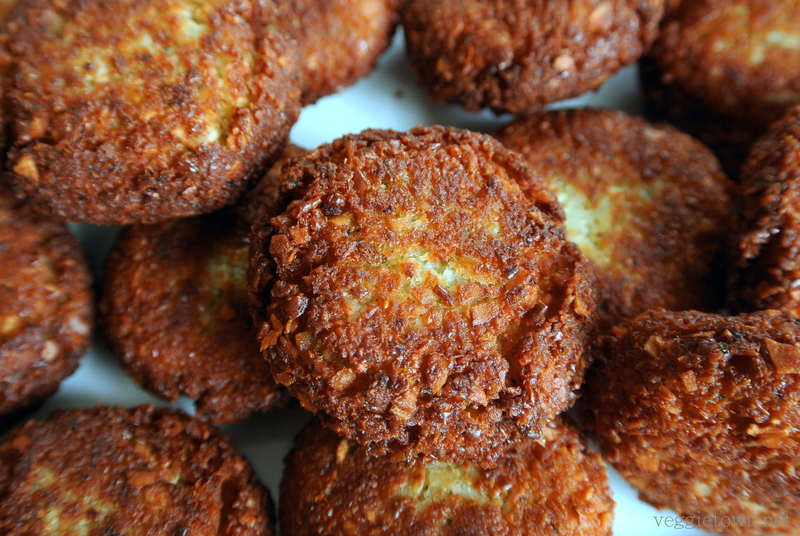 Bhajia is similar to falafel but instead of chickpeas it is made from black eye beans and the seasoning is slightly different. I have created my own version of the balls and this one is made with coconut flakes. 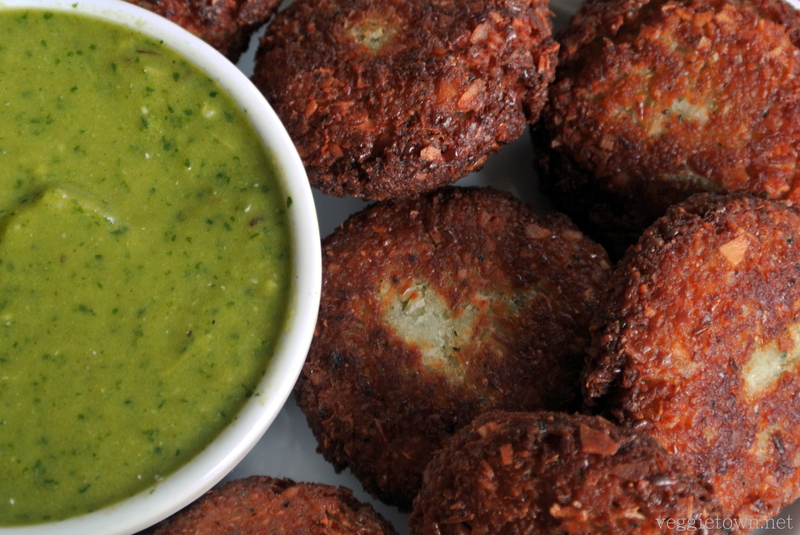 The coconut adds a bit more flavor to the bhajia and it is a great match with the sauce in this recipe. I have tried to create a sauce that resembles the one I had together with the bhajia last summer. 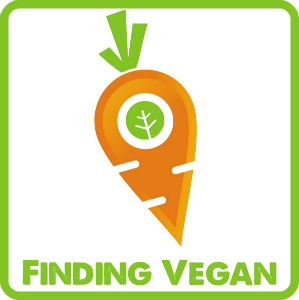 I believe I am not far away from it, although I chose to make mine with oven roasted vegetables. Why? Because almost everything tastes better when roasted in the oven. I hope that you will love this recipe as much as I loved my first bite of the Somali kitchen. I am sure future investigations of the cuisine from this country will result in many more recipes! Soak the black eye beans over night in hot water. Drain the beans from the soaking water and add to a food processor, together with the rest of the ingredient. Blend until you receive a mixture that is somewhere between the texture of couscous and a paste (similar to the one for falafel). Form small round balls and deep fry in hot oil. Heat the oven to 200°C / 390°F. Place the green tomatoes, jalapeños and garlic cloves (leave the cloves in their inner skin) on a baking tray covered with baking paper. Roast until the skin of the tomatoes and jalapeños become brownish (not black) and bubbly and the garlic cloves has become soft. Keep an eye on the garlic so it doesn’t burn. You may need to remove the garlic a bit earlier, from the oven, than the rest of the vegetables. Cut off the stems from the jalapeño and remove the skin from the garlic cloves. Place all ingredients for the sauce in a blender and mix until you get a smooth green fabulous sauce. 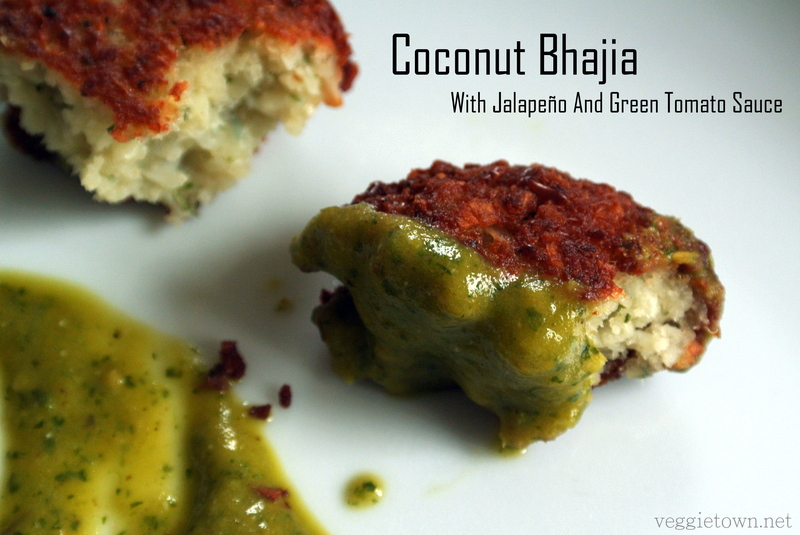 Serve with warm bhajia! Note: Depending on how hot you like your sauce, you may remove some of the seeds from the jalapeños after they have been roasted. For this recipe I removed the seeds from one out of the four peppers. But if you like it hot you should definitely leave all of them. This entry was posted in Main Course, Okategoriserade, Sauce Dressing and Dip, Side Dish. Bookmark the permalink.